Is there a set of rules that applies to the order we scrap our photographs... Absolutely Not! The last thing you should worry about is falling behind with your memory keeping as it will lead to frustration and the risk of giving up altogether. I learnt a long time ago that I need to just scrap what I feel like doing at the time so it remains enjoyable, fresh and fun. The photo in my layout is from 2012 and has been sitting on my computer with all my other photos waiting for inspiration to strike. And the good thing about having an electronic version is the date is always stored so I never forget when it was taken. 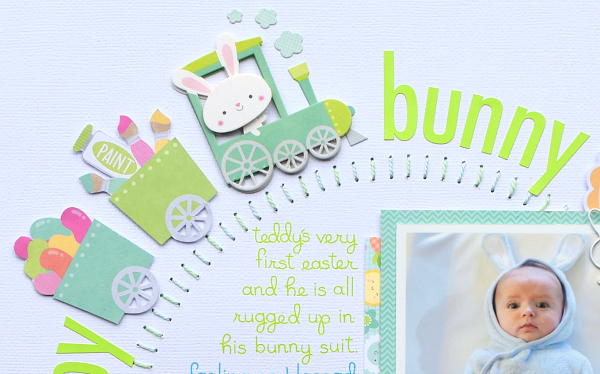 So, when Easter Express came along I knew I had a photo of Teddy as a baby that was a perfect fit and I enjoyed printing it out and preserving this precious memory. The Story | Our little munchkin 'Teddy' was a huge surprise so having a little human in the house took some getting used to again. I'd almost forgotten how much fun it was to dress little ones in cute and cuddly clothes, especially during the holidays. This little bunny outfit was so sweet and soft and people complimented him whenever he had it on. 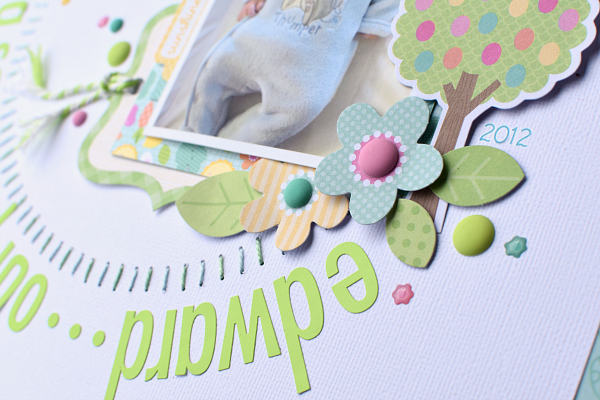 Product Crush | Can you spy the 'Cute Clip' on this layout? 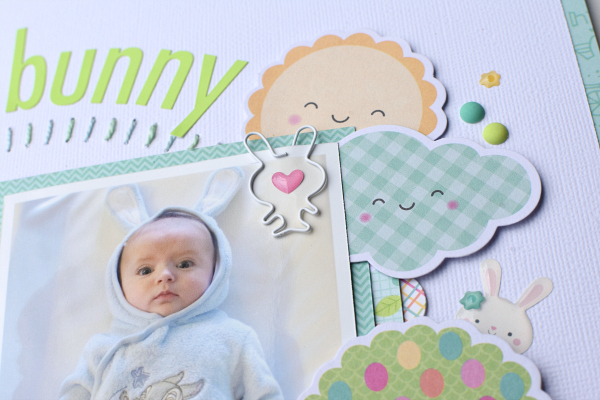 I could not resist attaching the sweet clip to the photo of Teddy as it matched perfectly with his bunny outfit! These clips come in so many different shapes to match the icons on each new collection. Journaling | I cannot express how important certain pieces of journaling are to a layout. You don't always need to write an extensive story with every picture but recording the date, month or even just the year and who is in the photo is a guaranteed 'must have'. In years to come you will thank yourself for making the effort. Tips | There's always some little trick you can do to add a bit of interest or make something a little easier when working with your projects. 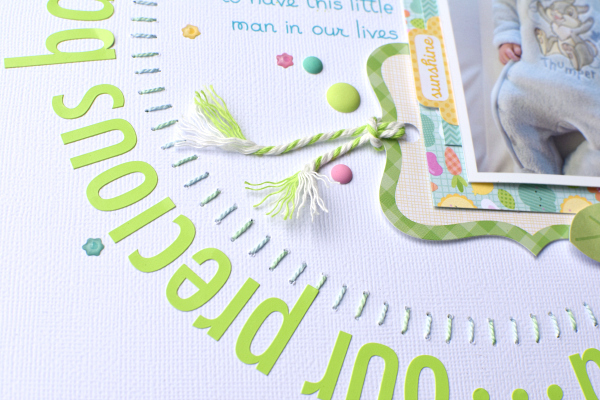 For example... adding baby powder to the back of adhesive stickers will instantly rid you of the adhesive so you can add foam pop dots to create different layers with your embellishments. You can also add a few dots of glue underneath your twine to keep it in place and also prevent the fringing from getting unruly when stored. Finally, try replacing the dot on an 'i' in your title with a flower, or star or even a heart for that extra finesse to your work. Easter Express is now in store front businesses and also on-line craft stores so you will be all set for this year's Easter photographs. Thanks for stopping by today. Melinda this is one of my favorite pages ever! So many great details - well done! How did you do the journaling AND how did you keep the spacing for the stitching so perfect?